There are many five card spreads. As we’re looking at simple ones for now, this is the simplest. Five is a strong esoteric number that keeps us grounded in the material world. This particular spread represents you and your worldly goals. Start with a clear mind and shuffle the deck. Draw five cards and place them face down in front of you in a line. Turn over the leftmost card, this is Card 1. Then work your way along to card 5. Card 1 represents you in your current state. Card 5 represents your goal. This may be a job, a relationship. Cards 2,3 and 4 represent the challenges that you’re going to need to overcome to get to your goal. You may already be aware of these issues, or you may not. For example, say you have a crush on somebody, but your problems are the following; you can’t talk to them because you’re shy, you don’t know them yet, and they aren’t aware that you exist. These are your three main issues. Lets take another approach. 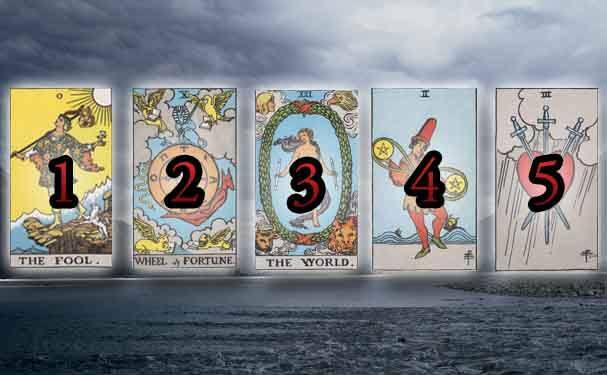 How was your Free Five Card Tarot Reading? Let us know in the comments below!